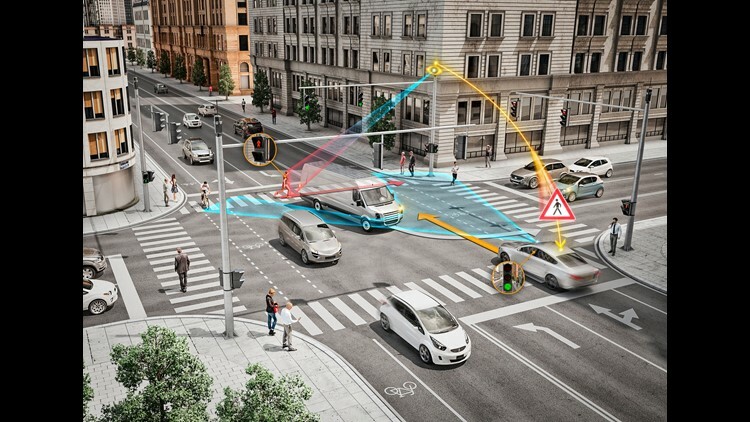 A system designed by auto supplier Continental enables wireless vehicle-to-infrastructure communication, allowing an above-the-intersection suite of sensors to detect pedestrians and alert oncoming vehicles to avoid them. The system will be tested in Columbus in 2019 as part of a Department of Transportation project. 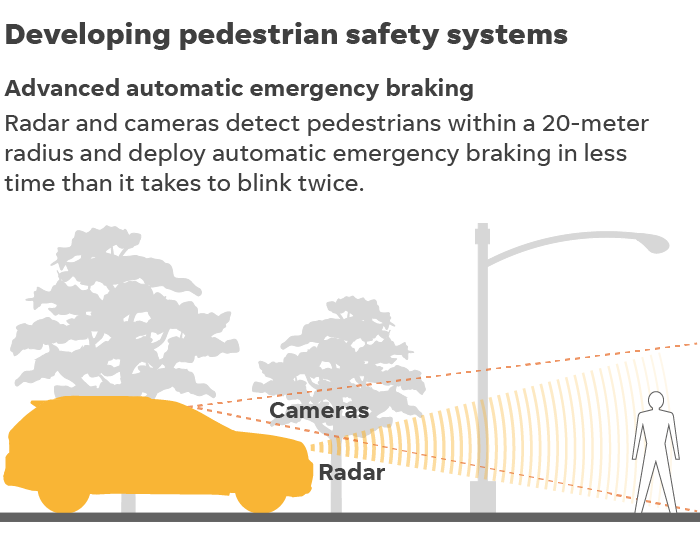 The need for advanced technologies to prevent cars from striking people is gaining greater urgency amid heightened awareness of the nation’s pedestrian safety crisis. Automakers and suppliers are developing an array of systems to avert accidents, including safer infotainment systems and crash-avoidance technology, not to mention the far-out solution: self-driving vehicles. As technology evolves, prevention is taking several forms. Crash-avoidance technologies are becoming increasingly common, such as lane-departure warning and systems that can accelerate and brake on the highway. About 73 to 80 percent of new vehicles sold in 2018 are expected to come with some form of crash-avoidance system, said Tom Mayor, industrial manufacturing strategy practice leader at KPMG. But those systems are largely focused on protecting people inside the vehicle, not outside the vehicle. Automakers representing more than 99 percent of vehicles sold in the U.S. have voluntarily committed to including automatic emergency braking systems as standard technology in all new vehicles by 2022. But more advanced systems, which improve pedestrian safety by avoiding walkers who are not visible to the driver, are already available in other markets. German supplier Bosch has developed a system that uses radar and cameras to detect pedestrians and cyclists within a 20-meter radius and deploy automatic emergency braking in less time than it takes to blink twice. It can even spot pedestrians through a cloud of steam rising from vents along urban pavement. The system is already rolling out in European vehicles, driven by stricter regulatory standards there that require pedestrian safety measures, said Kay Stepper, head of driver assistance and automated driving for Bosch in North America. But automakers have been slow to implement even the most basic emergency braking systems as they proceed toward their 2022 commitment. Only four of the 20 automakers that made the voluntary pledge had made the technology standard on at least half of their 2017 models, according to the National Highway Traffic Safety Administration. Enabling vehicles to communicate with road equipment, and the other way around, is envisioned as a key way to promote pedestrian safety. 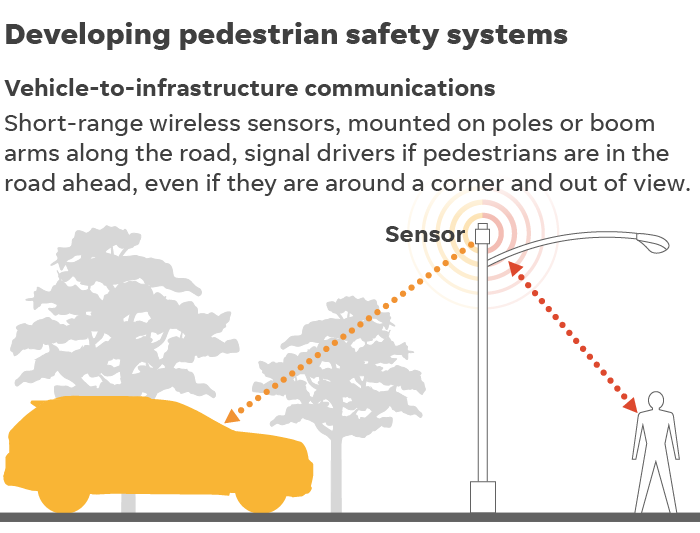 Auto supplier Continental is developing a system that uses short-range wireless communication to transmit signals from above-the-intersection equipment that detects pedestrians and conveys the information to vehicles in the area. The system is set for a real-world pilot debut in Columbus, Ohio, as part of a U.S. Transportation Department initiative in 2019. One key benefit: The detection equipment can alert vehicles to avoid jaywalking pedestrians around the corner on streets that even the most advanced vehicle’s on-board technology has no ability to assess. “We think this is a good way to prevent a lot of those intersection crashes and fatalities,” McClain said. The problem: It will take decades for all cars to come equipped with such systems, especially since a Cadillac luxury car recently became the first U.S. car to offer the option. In addition, government spending on basic infrastructure has been lacking. The crisis of distraction has worsened with complex touch-screen infotainment systems that take the driver’s eyes off the road. But automakers and suppliers are quietly developing augmented-reality systems that would project directions onto the windshield, KPMG’s Mayor said. Mayor said the systems may be close to coming to fruition, citing discussions with procurement executives at auto companies that are nearing production. The systems could ensure that people aren’t taking their eyes off the road, he said. 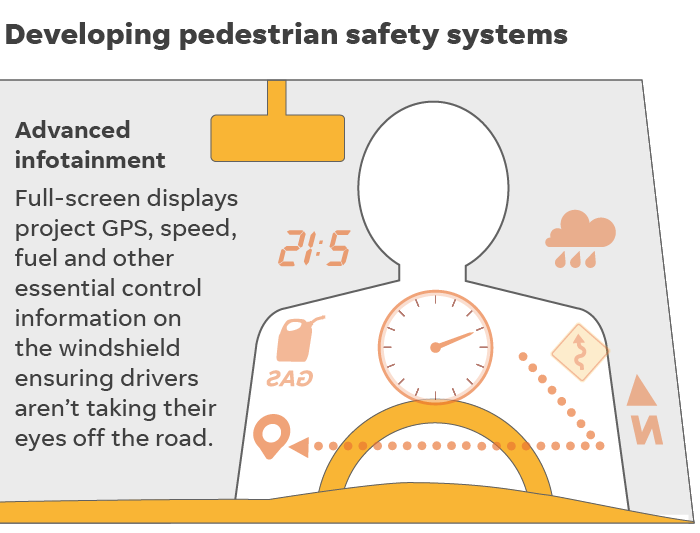 While advanced technologies get much of the publicity, improving pedestrian safety requires a renewed focus on the basics of automotive design and engineering. Poor headlight performance is a shortcoming for the automotive industry for a variety of reasons, including ancient regulations that have prevented engineers from adopting technology that automatically controls lighting dispersal to reduce glare and help drivers see better. The Insurance Institute for Highway Safety has conducted a series of tests in recent years that have shown many cars, including luxury vehicles, to be lacking adequate headlights. About 75 percent of pedestrian fatalities occur at night, Retting said. 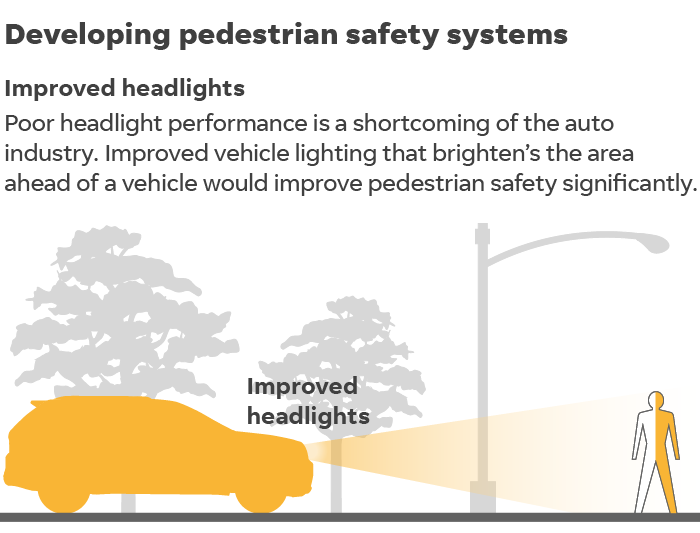 “Anything that could be done, particularly to vehicle lighting, that brightens the area ahead of the driver undoubtedly could help with pedestrian safety,” he said. The promise of cars that can handle all road functions on their own is the holy grail for the auto industry. The National Highway Traffic Safety Administration hopes that self-driving cars will play a key role in meeting its ambitious goal of eliminating all road deaths within about three decades. Most major automakers and many tech companies are pursuing vehicles that can drive themselves, including former Google project Waymo, General Motors, Tesla and Volkswagen. Someday, they may be able to prevent all pedestrian fatalities in which the driver would have been at fault in the past, as well as many in which the pedestrian made a mistake. But a recent deadly crash involving an Uber self-driving car, which failed to respond when a woman was crossing an Arizona street walking her bicycle, served as a reminder that autonomous vehicle technologies have a long way to go. 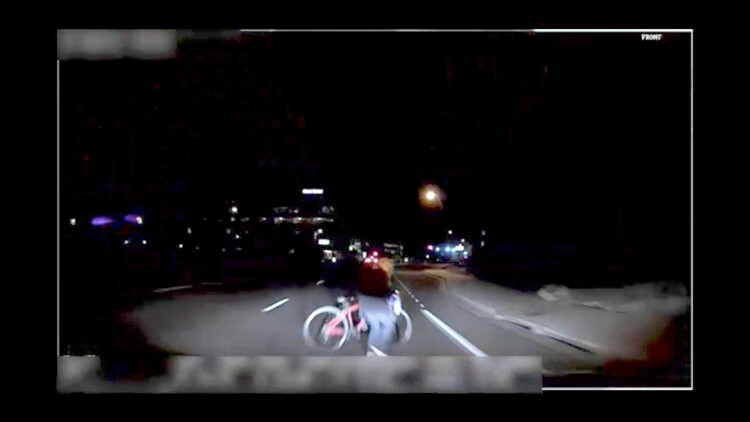 This image made from video Sunday, March 18, 2018, of a mounted camera provided by the Tempe Police Department shows an exterior view moments before an Uber SUV hit a woman in Tempe, Ariz. Video of a deadly self-driving vehicle crash in suburban Phoenix shows the pedestrian walking from a darkened area onto a street just moments before the crash. The National Transportation Safety Board said in a preliminary report on the crash that Uber had disabled the Volvo vehicle’s emergency braking system “to reduce the potential for erratic vehicle behavior.” But Uber did not program the system to alert the human operator to manually brake the vehicle, NTSB reported. If the emergency braking system had been activated, it would have been triggered 1.3 seconds before the car hit the pedestrian, according to the probe. The challenge for auto and tech companies is to perfect the systems to adapt to every single possible scenario. Even then, cars won’t be able to avoid all pedestrians. “Just like commercial air travel is today, it will be really, really, really good and really, really, really safe, but it’s not going to be perfect,” KPMG’s Mayor said.